The family Cryptobranchidae includes two genera, Andrias and Cryptobranchus. There is Andrias japonicus in Japan, A. davidianus in China and Cryptobranchus alleganiensis in North America (Fig. 1). It is said that Cryptobranchidae came from North America, through Europe to Asia ( Naylor, 1981). Fig.1. Distribution map of the family Cryptobranchidae. Habitat : This species is found in cold and clear streams with rocky bottoms and bank with burrows. In Hiroshima, the width of streams are usually about 10m. Also it occurs less than 5m from sites that include breeding locations. Currently, adults A. japonicus barely survive the horrible river conditions. There are few chances for these magnificent creatures to reproduce because of habitat degration. Breeding : This nocturnal species hides under rocks or in holes in river banks during the day. After sunset they go out of hiding and lie in wait for their food in slow-moving water until daybreak. Some do not go out, they are very fickle! The Asa zoological park's team observed the breeding behavior of this species in Toyohira-cho, Hiroshima in 1978. This species began to breed when the water temperature had dropped 20C degrees from the end of August through early September. There were 18 males and 9 females in the breeding group. The smallest male and female were respectively 30cm and 40cm in total length. They gathered in nests in the river bank as far as 30-600m from their own territories. The largest males occupied a nesting site and guarded a 2-3m radius around it. They then fought off other males awaiting potential mates. After a female came into the nest to breed, other males would then enter the same nest. Five females laid in the same nest for three days. A female usually lays 500-600 eggs. Larvae hatch in 40-50 days, they stay immobile until about January and then leave the nest little by little. Larvae were found in and around the nest to as far as 600m downstream at the Asa zoological park. The larvae measured 60-70mm TL in late June and then disappeared. Larger larvae have never been found. The Asa zoo team succeeded breeding this species in captivity after wild breeding observations were recorded. Dr Jiro Kobara describes captive breeding of A. japonicus in detail in his book (Kobara, 1985). 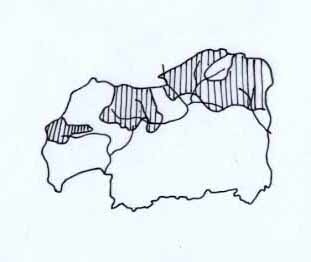 Range : Honshu to the west of Gifu Prefecture, parts of Shikoku and Kyushu (Fig.2). Mainly distributed in the Chugoku Mountains, Gifu, Mie and Oita Prefectures. 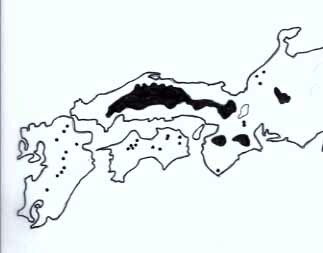 In Hiroshima, they are mainly found in the Otagawa, the Gonokawa and the Takahashigawa Rivers (Fig.3). From 300 to 700m in elevation. Some Andrias were collected at the Nikogawa River, 6 km from the sea; probably introduced there by man. There is a documented case of a man taking an adult from the Chugoku Mountains and releasing it in the Ashidagawa River near his home. Status : A Japanese national treasure, A. japonicus in a rare species of RDB Hiroshima, NT of Environment Agency, VU of IUCN, and classified a CITES I species(Tochimoto, 1996). This is one of the most threatened animals in Hiroshima. It was once very common in the Cugoku Mountains. Peaple usually ate them and kids caught larvae in small streams 40-50 years ago (Utsunomiya, 1998). They probably declined everywhere, but we don't have comparable past datas. Conservation : Dams prevents thier migration and separates their populations. With river quality in decline artificial nesting sites are being used. They are made of a pipe with a diameters of 20cm connected to a breeding bed with a diameters of 60cm, it has a cover and a peep-hole. In Hyogo Prefecture, some females lay eggs in this nest, but the eggs tend to die. The nest is also continually buried underground by river flow(Tochimoto, 1998). Another dificult task is detemining a clear idea of the larval stages in A. japonicus' life cycle. There is very little knowledge of larvae and juveniles. These are called the "missing link" of A. Japonicus. Even if adults breed, it is fruitless if the next generation does not survive. We are now trying to study microhabitats and lifehistory of Andrias larvae with permission from the Agency of Cultural Affairs. If these tasks are overcome, we may be able to protect Andrias japonicus from extinction. The decline of giant salamanders is not only a Japanese problem, but also Chinese, U.S., and the rest of the world's. Fig.2, Fig. 3. 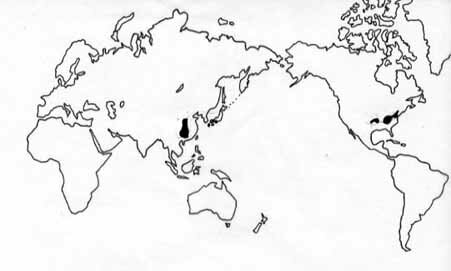 Distribution map of Andrias japonicus in Japan and Hiroshima, adapted and redrawn from Kobara(1985). Thanks Patric Jackson for his help. The Andrias Homepage/2000-2001. Copyright Sumio Okada.